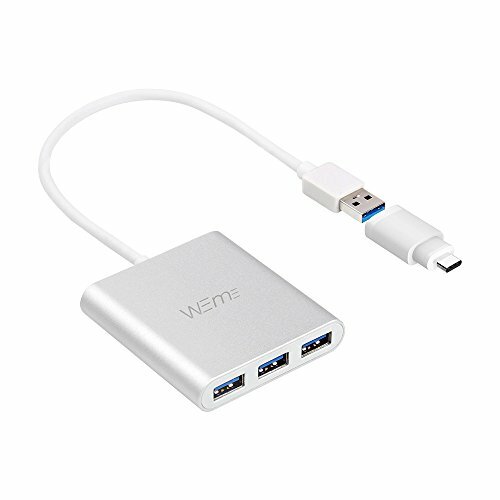 WEme 2-in 1 Aluminum 3-Ports USB 3.0 Hub with Type C Adapter & a Smart Charging port, which is theoretically twice as fast as USB 3.0 and up to 10x more than USB 2.0, allow you to attach 4 USB peripherals to your computer instantly and simultaneously, easily expand and accelerate your data transferring and charging. Don't deny your devices access to SuperSpeed ports. With the SuperSpeed USB 3.0, you can now transfer data at up to 10 times the speeds of the older USB 2.0/1.1 standards! That's fast enough to transfer a full HD movie in just seconds! You can connect all of your USB devices at one time, such as keyboards, mice, digital camera, smartphone, USB flash drive, external HDD ect.